Whenever someone finds out that I avoid grains and gluten in my diet, I inevitably hear the question, “What do you eat? !” This usually involves a question about lunches, with people wondering what to do when sandwiches are no longer an option. There are so many options for grain-free and gluten-free lunches – you just have to think outside the box a little. Make tuna salad and eat it over lettuce instead of between two pieces of bread. Roast up a chicken for dinner and then shred up the leftovers with the veggie of your choice, re-heat and enjoy. Make a big pot of soup, stew, or chili and portion out a few servings for the work or school week. 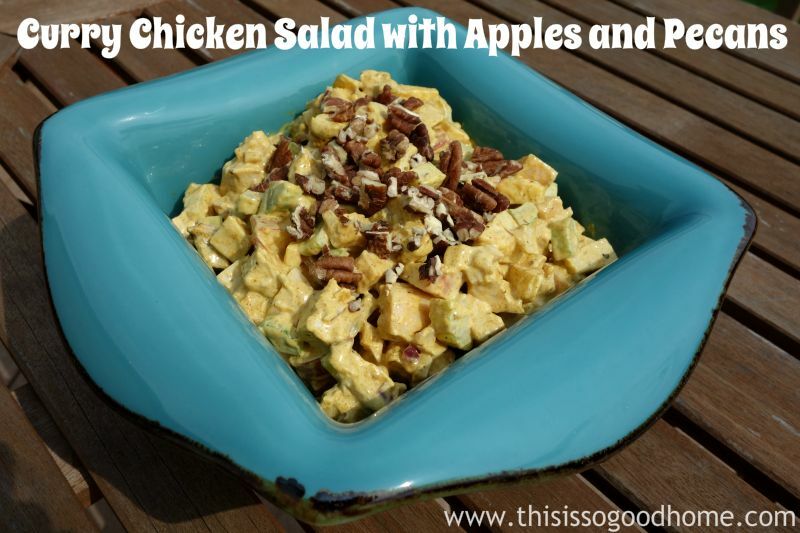 This Curry Chicken Salad with Apples and Pecans is perfect for lunch or a light dinner. I like to eat it just as it is, but if I have some mixed greens, it is a delicious topping for that too! This recipe is flexible in that you can swap out some of the ingredients and make it suit your tastes. Not a fan of apples? Put some sliced grapes in there. Like things a little spicier? Use hot curry powder instead of sweet. Prefer carrots to celery? Go for it! The only thing I strongly recommend is using a good high-quality mayonnaise and the best way to ensure that is to make it yourself. Don’t panic, it’s super easy. Check out how in this post. Optional, but delicious: Greens or salad mix of any kind. This is especially delicious over baby lettuce and arugula. 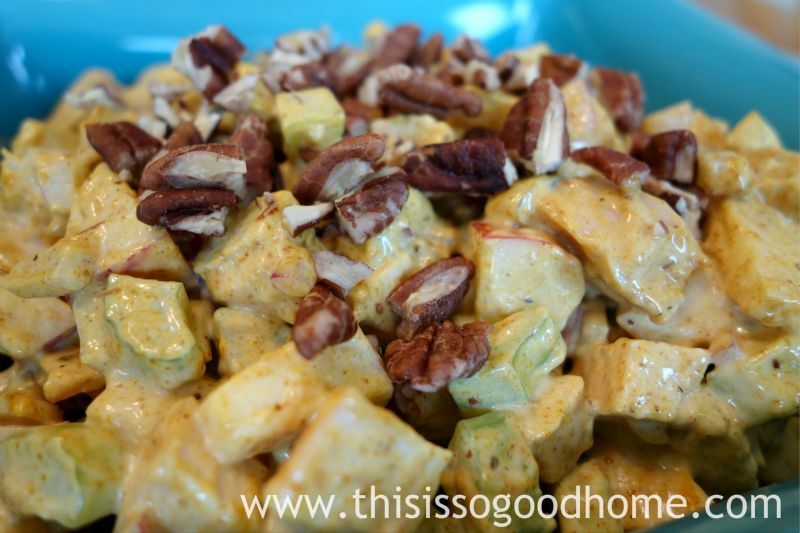 Combine all of the above ingredients (except pecans) in a large bowl and mix well to combine. I have been wondering about what takes place when the nuts are sprouted ? I soak and soakbut not much sproutage happening. Hi Shelly – If you sprout the nuts, you’ll see small little greenish white sprouts come out of the end of the nut. If you are soaking yours and they are not sprouting, there’s a chance they are not truly raw nuts. If they have been pasteurized or irradiated, they won’t sprout.